The main difference between sensor and actuator is that a sensor is used to monitor the changes in the environment while an actuator is used to control the environmental or physical changes. Sensors and actuators are two important devices used in many electronic and embedded systems. Sensors connect to the input ports of the system while actuators connect to the output ports of the system. Home automation systems, medical devices, robots, nuclear systems, video games, flight control systems, security systems etc. are some common applications that use sensors and actuators. A sensor is a device that can detect the changes in a physical environment. It can convert physical parameters such as temperature, heat, motion, humidity, pressure, etc. into electrical signals. We can transform this signal into a human readable display and send them through a network for further processing. There are mainly two types of sensors as active sensors and passive sensors. Active sensors require power supply while passive sensors do not require a power supply. Some popular sensors are as follows. Biosensors – These sensors use electrochemical technology. Medical devices, food and water testing devices use these sensors. These sensors help to analyze cells, proteins, nucleic acid, etc. Image Sensors – These sensors use Complementary Metal Oxide Sensor (CMOS) technology. They detect and transfer information used to make an image. Consumer electronics and surveillance systems use these sensors. Chemical Sensors – These sensors helps to get information about the chemical composition of the environment such as liquid, gas phase, etc. Motion Detectors – These sensors are based on Ultrasonic, Microwave, radar technologies. Security systems, video games etc. use them. Accelerometers – These sensors use Micro Electro Mechanical Sensor Technology. Patient monitoring, vehicle systems etc. use these sensors. An actuator is a device that converts a control signal into some kind of movement. It obtains a control signal in the form of electric voltage, current, hydraulic fluid, pneumatic or hydraulic pressure. The actuator converts the received control signal into mechanical motion. Furthermore, speed, force, operating conditions and durability are some important facts to consider when determining the performance of an actuator. Electric motors, stepper motors, comb drives, hydraulic cylinders, etc. are some common actuators. A simple example of a system that uses both sensors and actuators is a temperature controlling system. A temperature sensor can convert the temperature in the environment to an electrical signal. An electric motor operates as an actuator converts that signal into movement. It can result in rotating a fan. Therefore, if the temperature is high, the fan starts rotating. A sensor is a device that detects events or changes in the environment and sends that information to other electronic devices while an actuator is a component of a machine that is responsible for moving and controlling mechanism. 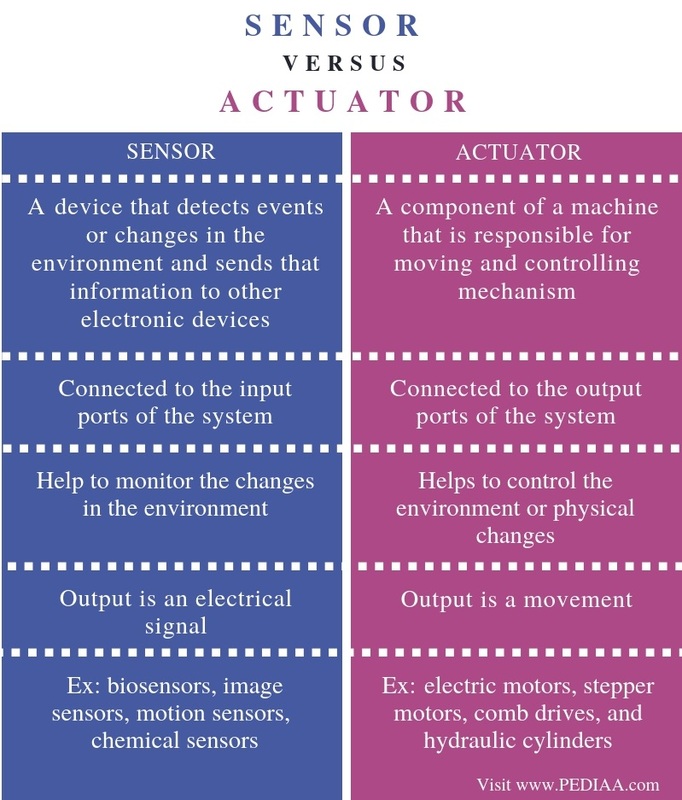 Thus, this is the main difference between sensor and actuator. Furthermore, sensors are connected to the input ports of the system while actuators are connected to the output ports of the system. Another major difference between sensor and actuator is that sensors help to monitor the changes in the environment while actuator helps to control the environment or physical changes. Moreover, the output of sensor is an electrical signal while the output of a sensor is a movement. Hence, this is another important difference between sensor and actuator. 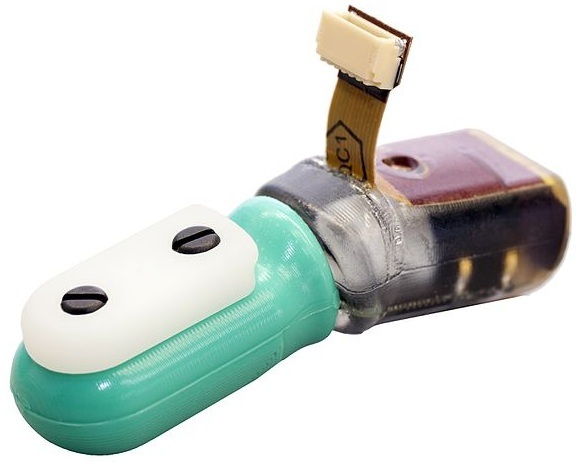 Biosensors, image sensors, motion sensors, and, chemical sensors are some examples of sensors while electric motors, stepper motors, comb drives, and, hydraulic cylinders are some examples of actuators. The main difference between sensor and actuator is that a sensor is used to monitor the changes in the environment while an actuator is used to control the environmental or physical changes. Both sensors and actuators allow the proper functioning of the system. 1.“Sensor.” Wikipedia, Wikimedia Foundation, 23 Jan. 2019, Available here. 2. “Sensors: Different Types of Sensors.” SuperAdmin, Available here. 3. “Actuator.” Wikipedia, Wikimedia Foundation, 3 Jan. 2019, Available here. 4. “What Is an Actuator? – Definition from Techopedia.” Techopedia.com, Available here.